When I brought home a lovely pachyrhizus erosus (a.k.a. jicama) a couple of weeks ago, I wasn’t sure just what I was going to do with it. Not because I didn’t have ideas, but because I couldn’t decide which one to try. Baked jicama fries? Raw jicama fries? Roasted jicama? Spicy raw jicama chips? Stir-fry? Jicama salad? Or maybe slaw? The possibilities seemed endless. So, there it sat on my counter-top for almost a week, watching his fellow mates in the produce bowl disappear one by one, becoming lonelier by the day. I knew I wanted to make something that would highlight the hydrating root’s crunchy texture. My vision, or rather my flavor fancying, also included fresh ginger, lime, and a hint of sour. Finally, it hit me! I knew just what how I wanted to enjoy this crisp, fibrous tuber. 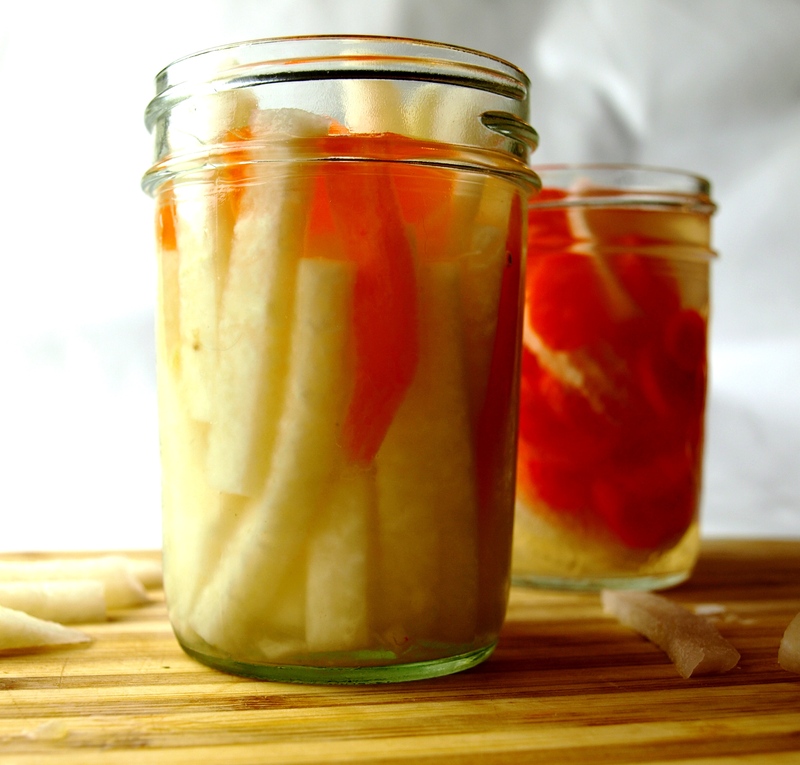 I would combine these flavors and make some yummy sour and tangy pickled jicama! 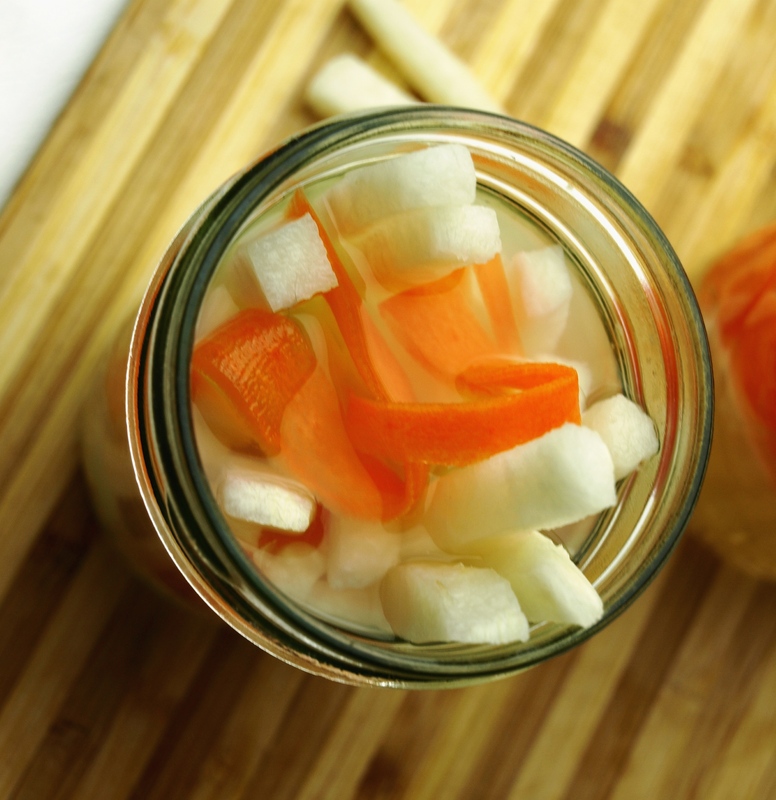 After quite a bit of research on the different pickling techniques out there, I decided to go with a quick Vietnamese-style pickled vegetable. No boiling, canning, brining, waiting, or whining 😉 Just thinly slice your veggies, mix up equal parts vinegar and water, add a little salt and sweet, combine in a clean jar, and done! Well, there is a tiny bit of waiting, just an hour in the fridge and the pickles are ready to be snacked on. Much better than waiting a week for your snack fix, though. A Snack to End Sugar Cravings? After re-reading my post from last week for my wholesome Peanut Butter Chocolate Chip Oat Cookies, and thinking about my comment that I can’t go more than 12 hours without a sweet fix (which is true! ), I decided to give myself a mini challenge. After all, as a healthy eating advocate, I knew I could do better than that, and I should at least try! So, for the past week, I’ve been working on taming my inner cookie monster. 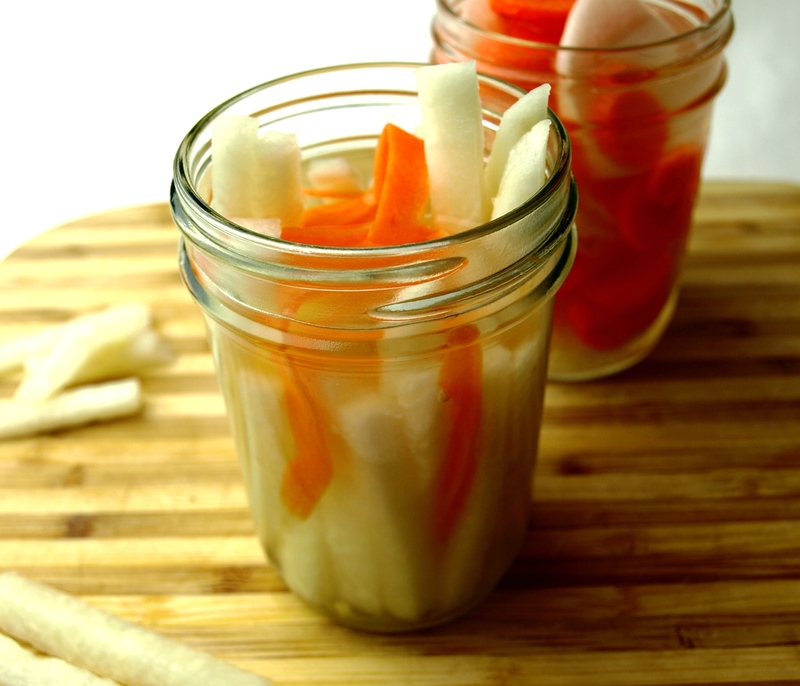 Coincidentally, these crunchy pickled jicama sticks seemed to help me do just that. Preventing Heart Disease – Acetic acid in rice vinegar may help lower triglycerides and cholesterol levels, reduce blood pressure, and may also reduce the amount of fat in your liver. Fighting Cancer – Research suggests that Kuroso, a type of rice vinegar, may help prevent lung, breast, bladder, esophageal, and prostate cancer. Reducing Muscle Pain and Injury – Some claim that ingesting foods containing vinegar, or drinking diluted vinegar may help with muscle pain from working out or running. Amino acids in rice vinegar may reduce lactic acid in the bloodstream, reducing fatigue and pain. Killing Harmful Germs – Studies have concluded that soaking vegetables like lettuce and carrots in vinegar can kill E. coli and Salmonella. The organic acids in vinegar may also kill germs inside your body as well. Some folks swear by slugging down their daily dose of vinegar mixed with water. Now, I don’t know about you, but I’d rather get some vinegar into my diet via these little crunchy pickles, rather than a diluted vinegar cocktail. Including a little vinegar in your diet just may reduce your risk of cancer and heart disease, as well as controlling your blood sugar and body weight. Keeping your blood sugar balanced and reducing sweet cravings and sugar consumption is beneficial for your health and your looks. Spikes in blood sugar levels can lead to hormone imbalance and inflammation, exacerbating acne, rosacea, and skin aging. It could also eventually cause hair loss, and excess facial hair growth. 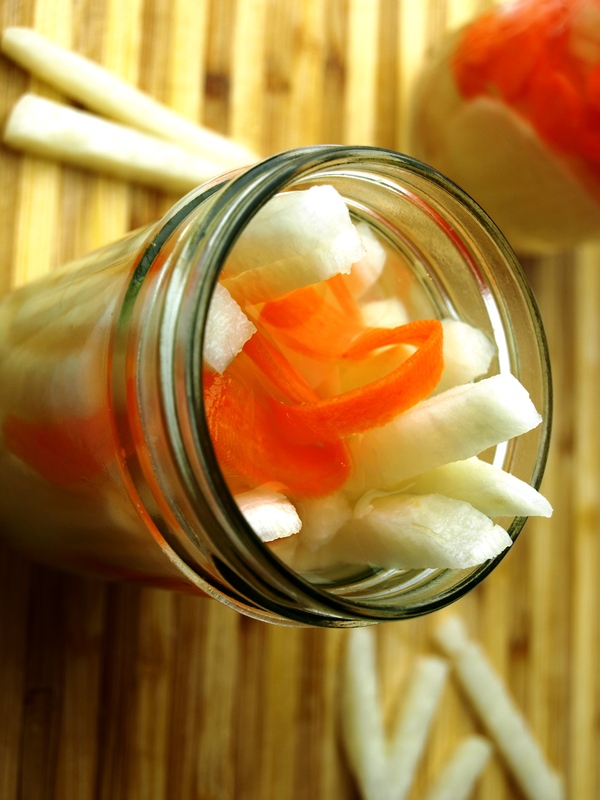 Reaching for these pickles when you’re hankering for a snackety snack, could help you keep those sweet cravings at bay, balance blood sugar levels, help even out hormone levels, and support weight loss efforts. I just love these easy pickles! 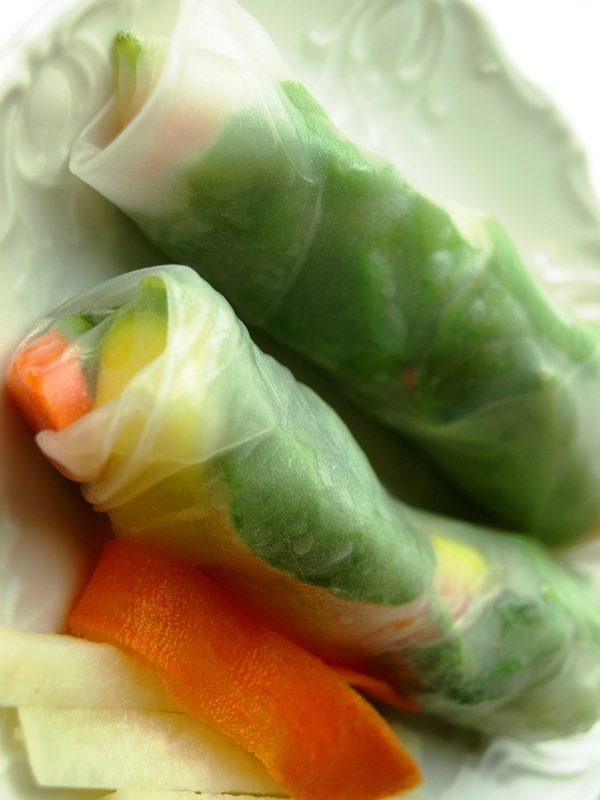 Keep in mind that they aren’t truly pickled, in the sense that they have been preserved, so you will want to eat these up just like you would any raw salad, in about 3 days. Trust me, they will go fast, especially if you’re tucking them into sandwiches, rolls, wraps, and snacking on them between meals. Be sure to try out other veggies as well, like carrots, daikon, radishes, onions, cucumbers, or anything else your little pickle loving heart desires!